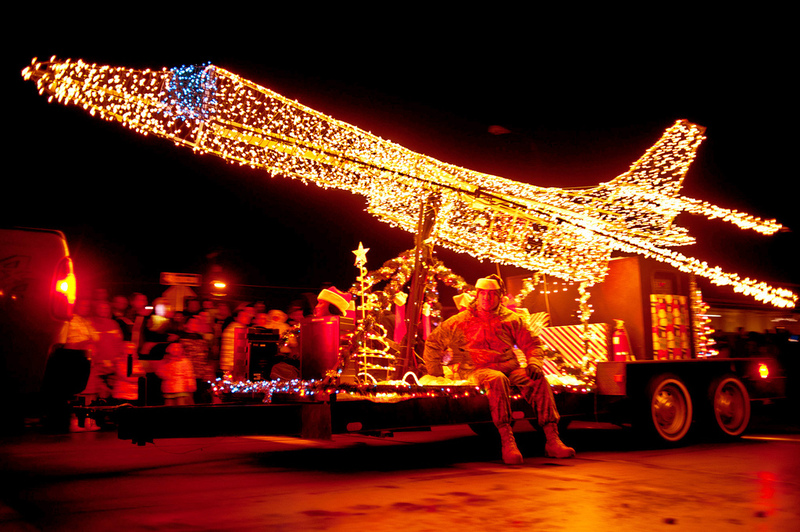 Ellsworth Air Force Base enters their bomber lights annually to the parade of lights. Photo courtesy of the US Air Force. The day’s activities began with the Holiday Celebration in Main Street Square. Free horse-drawn wagon rides were accompanied by performances from the Black Hills Figure Skating Club, which is made up of our own local figure skaters. Santa arrived in the square around 2:00pm and stuck around for visits from the kids. The Potter Family also made an appearance, entertaining the public with Christmas carols and beautiful music. All of this was only the lead up to the grand lighting of the Main Street Square tree. The tree is the biggest one yet to be placed in the square and was just recently donated by a man living in west Rapid City. There’s no doubt Main Street Square has become a hot spot for community connections and gained the love of many citizens. With all the activities it hosted during the parade, it was also home to food vendors selling everything from Christmas cookies to the much needed hot drinks such as hot cocoa.